On one level, Birdman is a technical tour de force with the appearance, aided by digital editing, of having been shot in one long continuous take — something that apparently thrills cinephiles. For ordinary moviegoers like me who don’t watch movies to discover where the camera is planted, it has the energetic, sometimes jittery effect of making everything feel as if it’s happening in real time. That effect, coupled with the set, the actual weathered and dusty St. Francis Theater on 44th Street in New York, makes us feel as if we’re backstage, seeing things that are normally kept secret. Reason two: Michael Keaton. Keaton is an atypical Hollywood leading man, always infusing his roles with a good dose of weirdness. Here he plays Riggan Thomson, a former film superhero now trying to prove his artistic mettle with a tortured theatrical adaptation of the Raymond Carver short story, “What We Talk About When We Talk About Love.” As Thomson, Keaton frets and sweats and worries, his brow permanently furrowed, while courting the fantasy of maintaining super-human powers. His bug eyes, cemented into our brains by Beetlejuice, serve him well in Birdman. Reasons three, four, five and so on: a great supporting cast, especially Edward Norton as an obnoxious thespian, especially in the slap-fight scene in his underwear; especially Emma Stone as Thomson’s disheartened daughter, fresh from rehab, especially her bulging blue eyes that look like they contain all the pain in the world; especially Amy Ryan as Thomson’s ex-wife, the only grounded character in the film who is kind enough and cares enough about Thomson to worry about the demands he’s putting on himself, who counsels him gently, always with a sad smile on her face that says, I know you and I know you’re headed for a fall. The rapid-fire dialogue is refreshingly smart and keeps us thinking while we’re being wowed by the cinematography and the acting. Altogether, two hours-plus well spent. According to an interview in Variety, when Inarritu first interviewed Michael Keaton for the role of Riggan Thomson, the director told the actor “that the part would require him to appear spiritually and physically naked onscreen,” a challenge that Keaton was more than up for. 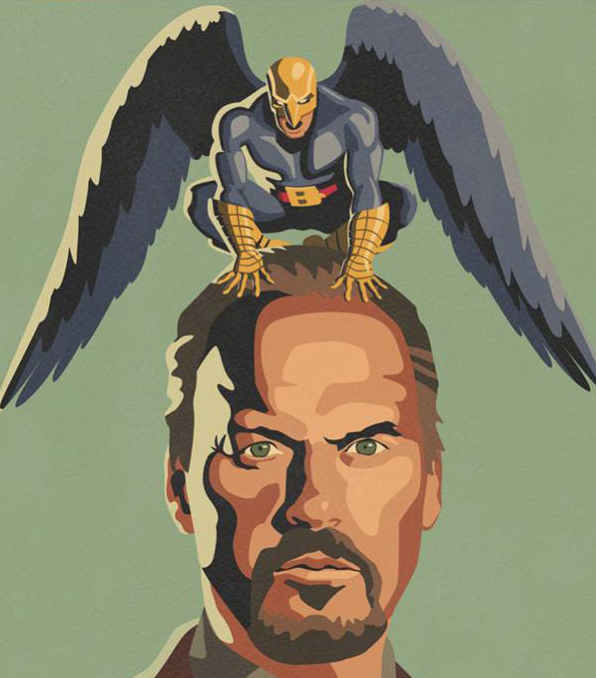 What I love most about Birdman is the degree of honesty delivered in Keaton’s performance. Thomson is filled with regret for the ways he’s failed his daughter and wife; he’s terrified that his life and career have all added up to nothing; he’s more than a little crazy; and he’s ravaged with determination to make this unlikely theater production work — and all of that is deeply imprinted on Keaton’s face and body, in every scene. Beloved, to feel myself beloved on the earth. Regret, desire, failure, longing, the primal urge to feel beloved, are all wrapped up in this fragile character, so beautifully cast and played by Keaton. Don’t think too long about being submerged in inescapable reality for three desperate days or it’ll make you hyperventilate. To a degree, that’s how watching Birdman makes a viewer feel, but with the blessed gift of comic relief. Birdman is a triumph on so many levels that it’s easy to forgive it for dropping some of the secondary story lines along the way. What matters is Riggan Thomson’s anguished plea to be loved, to matter, to know that he’s made it. What matters is that in the unedited version of our lives, we all know how he feels. It’s what we talk about when we talk about love.